Buenos Aires is a buzzing city and popular tourist destination in South America. No other place in Argentina reflects a diverse culture, the result of immigration over the centuries, better than the capital. It goes without saying the local gastronomic scene is heavily influenced by culinary contributions from Spanish, Italian, Arabic, Asian and European migrants. Both porteños – an endearing term for the city’s residents – and tourists enjoy this multicultural environment. While Buenos Aires is regarded as the world’s steak capital, it has a variety of dishes on offer with varied flavours and textures. From cheesy pizzas to scrumptious flans topped with dulce de leche, you get to explore classic recipes and innovative variations. This mini guide brings you 10 classic dishes and street foods in Buenos Aires. Some are found all over Argentina while a couple are unique to this port city. Breakfast is incomplete here without an assortment of breads accompanied by Media Luna. 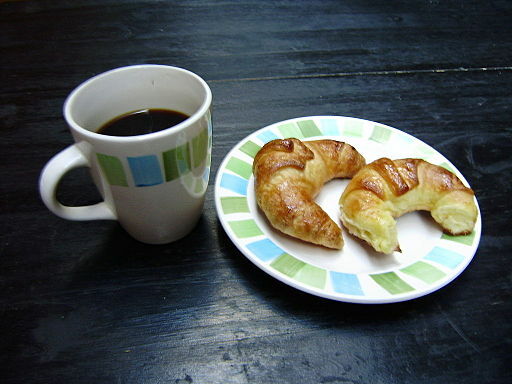 These crescent shaped croissants are sweeter and smaller than standard flaky pastry, and are served along with tea, coffee or yerba mate. This dish is also eaten as a mini meal before dinner – merienda. You’ll find bakeries at every street corner selling plain and filled versions containing ham and cheese or simply cheese. 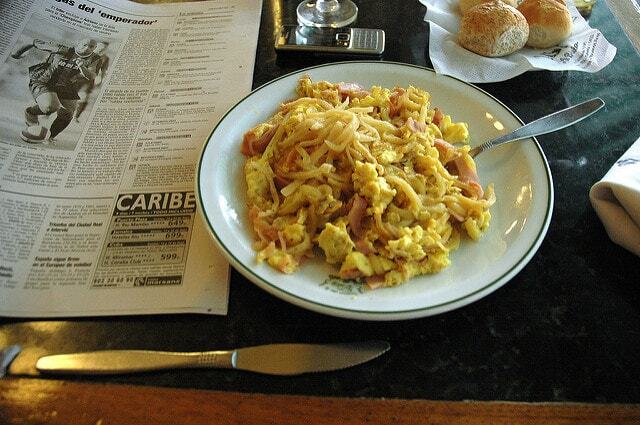 An authentic local food, Revuelto de Gramajo is a mix of ham, eggs and fried potatoes made and served on the spot. There are different stories on how this dish was created in 1879 and named after a Colonel serving under an Argentine President. The small Armenian community has lent delicious meals to the city’s food palette. 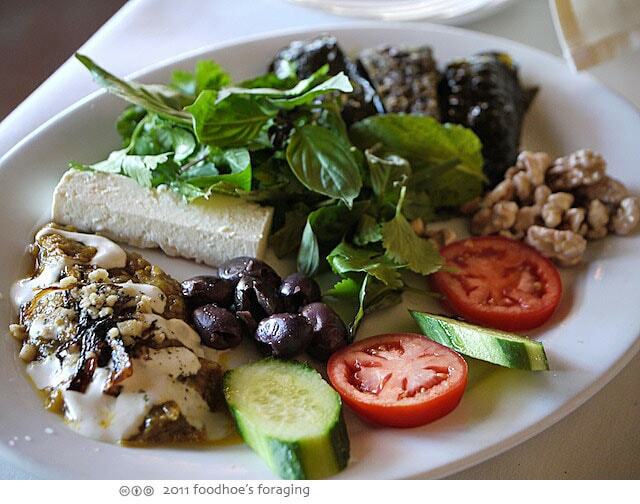 The mezze served at restaurants in Palermo have a distinct Middle Eastern touch and are a good option for vegetarians. You’ll find plant-based dishes like grilled eggplants with herbs or walnut with mashed red peppers, and feta cheese with peppers. This homemade dessert is basically made with eggs and milk. 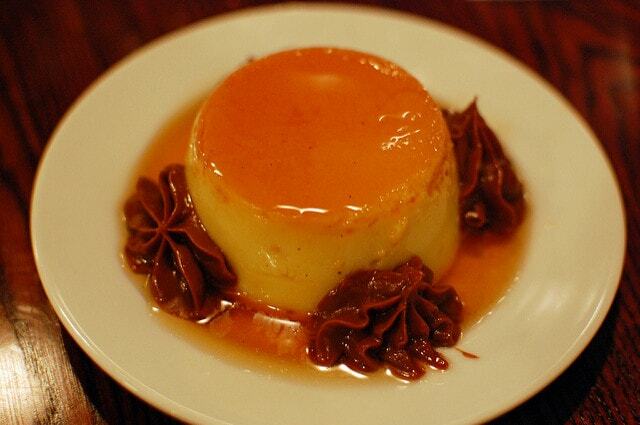 The Spanish version was modified by the locals who use dulce de leche (caramelized condensed milk) and whipped cream. Another classic recipe that finds its way into party menus, this is the stuffed version of popular Argentinean dish matambere. The flank steaks or thin cuts of beef are filled with stuffing including bacon, boiled eggs, dried tomatoes, bell peppers, barbecued sausage, marinated veggies or meat, potatoes, onions, and cheese. The filling is seasoned with herbs and spices and the steak is either rolled up or placed flat on the plate. 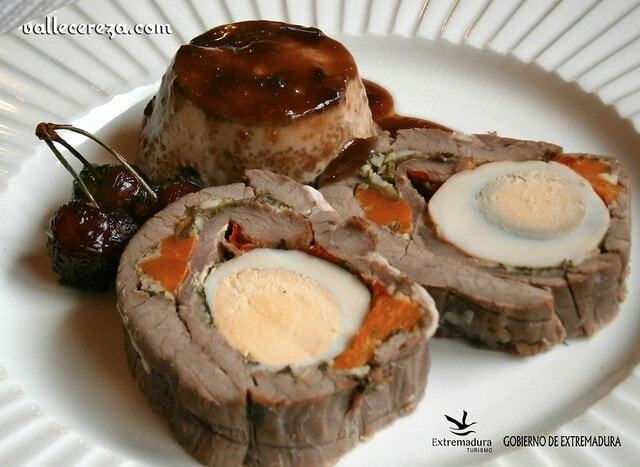 Matambre relleno is usually served in restaurants as a cold appetizer with a Russian salad. Another gift from Italian immigrants, pizza shops are ubiquitous parts of the city streets. Pizzas here are cheesy and thick crust affairs. A classic version unique to the city is the fugazzeta with mozzarella and carmelised onions. 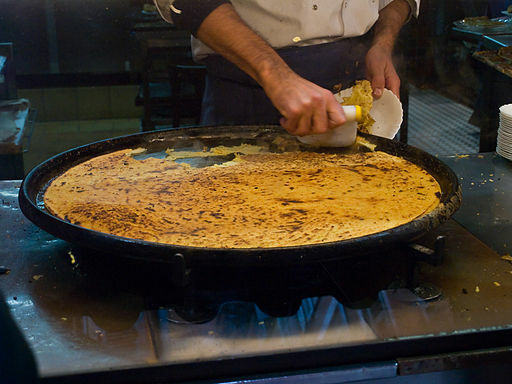 This is usually accompanied by faina – a round, flatbread made with gazpacho beans. If you bored of fugazzeta, there is always Neapolitana, with mozzarella, garlic and tomato, Calabrese, with chorizo and cuatro queso (4 types of cheese), Fontina with mozzarella, basil, sweet corn, fontina cheese and roasted peppers and basil, or pizza a la parrilla (barbecued pizza). 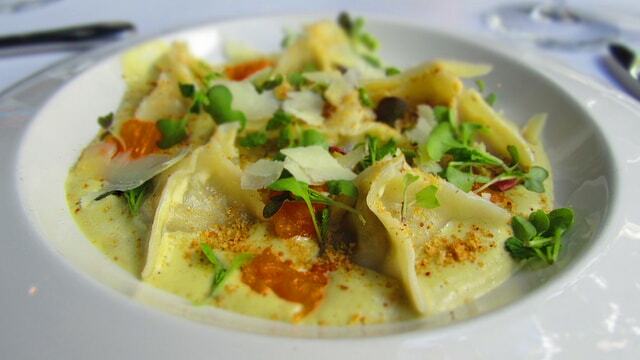 Italian influence on the food scene extends to pastas as well. Various fillings are served fresh in pasta shops across the city. A favourite street and home food version is ravioli stuffed with ricotta cheese, herbs and spinach or pumpkin. 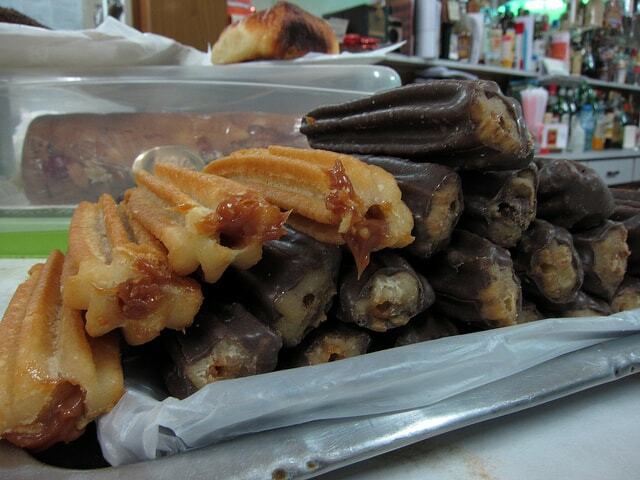 That Argentineans have a sweet tooth is seen from their love for churros. These thorny stick-shaped doughnuts are crispy and greasy on the outside, and reveal a moist interior filled with dulce de leche or chocolate syrup. You’ll find street vendors serving the plain, fried version with a generous sprinkling of sugar. If you love all things sweet, then give in to the temptation. 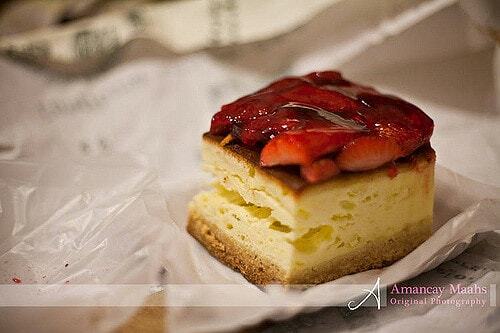 Head to the nearest pastlerlia (bakery) and try some original postres or tortas. What makes them unique? These freshly baked cakes are tender, soft and very creamy compared to their European counterparts. This sweet dough recipe was introduced by European settlers. 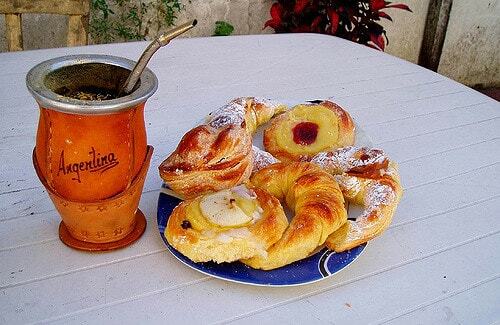 These pastries are found in bakeries (panaderias) across the city. Like media luna, these are either plain or stuffed with dulce de leche, quince paste or cream custard. They are covered in white or black sugar. You’re supposed to dunk them in your latte or cocido mate (yerba mate tea).